HOLLYWOOD—Julie Hagerty has been making audiences laugh for four decades. From her first starring film role as feisty flight attendant Elaine in the Zucker-Abrahams-Zucker comedy “Airplane!” to her memorable performances as an uprooted yuppie in Albert Brooks’ “Lost in America,” to her role as the understanding wife opposite Richard Dreyfuss in “What About Bob?” not to mention her numerous TV guest appearances and theater work, the Julliard-trained former model has done it all. 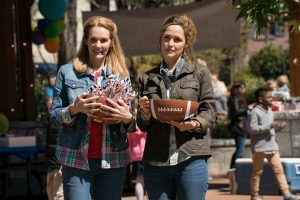 A California transplant by way of Cincinnati, Hagerty now plays the mother of Rose Byrne’s DINK (dual income no kids) character in “Instant Family,” a heartwarming comedy about a childless couple embarking on a journey of fostering children and adopting them that was written and directed by Sean Anders (“Horrible Bosses 2,” the “Daddy’s Home” films) based on he and his wife’s own experience. As Jan, Hagerty plays an endearing mom who’s excited but also surprised that her longtime married daughter Ellie and son-in-law Pete (Mark Wahlberg) have suddenly decided to become instant parents. Silly yet supportive, Jan does her best as an instant grandma to her new three young grandchildren. A master of keeping a straight face in wacky situations, Hagerty’s gifts are on full display in this supporting but memorable role. At one point, she allows her two younger grandchildren to draw all over her face using markers, though she doesn’t realize until it’s too late that they are using permanent ink. Jan also has a fun rivalry with her son-in-law’s more demonstrative playful mother played by “The Americans’” Margo Martindale. We caught up with Hagerty by phone just days after the deadly Woolsey wildfire destroyed hundreds of homes in Southern California and claimed at least three lives. The areas hardest hit were the communities of Malibu and Northwest Los Angeles County where many celebrities live. Though Hagerty was safe during the ordeal, she knows friends and colleagues who were personally affected by the blaze. The devastation and displacement of residents who were affected by the Woolsey Fire convinced the filmmakers and the studio Paramount Pictures to forgo the usual red carpet and post-premiere festivities, and instead donated the food and libations to the evacuation shelters instead—a decision that Hagerty wholeheartedly supports. Q: How have you been coping during the wildfires here in Southern California? Hagerty: I have so many friends (affected). It’s just terrifying and heartbreaking. Q: Did you have to evacuate? Hagerty: We were fine. We had to evacuate during the Skirball Fire (near Beverly Hills) last year. It’s terrifying because in a split-second you’ve got to decide what’s important to you. My heart goes out to every single one of those people who were affected by the Woolsey Fire. Phil Reeves, who plays my husband in this, was on evacuation notice and he took in three people. This is a time when we all have to get together, be together, and take care of each other. It’s heart-wrenching what’s happened. I was so proud of Paramount and Sean (Anders). We went to the movies and saw the film and had popcorn. But all the food (for the party) was taken to where evacuees were staying. That’s how it should be. Q: So, you didn’t have a red-carpet premiere and party like most big Hollywood films do. What happened? Hagerty: It was neat because they made the decision to cancel that take all the food that had been prepared for the after-party and donated it to the evacuation shelters where the victims of the wildfire were staying. So, Paramount, Sean and everyone else—their hearts are true. Q: You’ve got this new film, “Instant Family,” which is both a comedy and has a lot of poignant moments and situations that are very emotional. Hagerty: That’s how I felt when I read the script. I thought it was just what we needed right now. It’s about family, friends, friends who become family. It’s about giving. I thought it was so wonderful and brave for Sean to write this movie about his family. It’s very colorful. To put this story up there and show it to the world to see. He is just so passionate about foster care. It’s the first movie, I feel, that’s ever opened (the audience’s) eyes to these children and that they need home, and that people need these children. It’s pretty spectacular. Q: You deliver a hilarious performance as Jan, Rose Byrne character’s mother. When did you know you had this gift for comedy? Hagerty: I don’t know. I do like to laugh. But I never find it funny when I’m acting. I just do it from my heart. I think about that person would do it. Sometimes, people laugh and that’s wonderful. I never thought, “Well, I’m gonna go be funny.” It sure is wonderful, though, if someone laughs. It’s joyful. Q: How is it shooting those scenes where the family is all around the table talking. Do you have a chance to improvise much? Hagerty: In the dinner scene in the movie, it was shot pretty much as written in the script. Sean let us improvise a little bit, as long as it was story-driven. That scene was written as how a lot of Thanksgiving dinners or other family dinners go. It starts off with all good intentions and then wafts down into like, “Uh-oh.” I have to say, it was a great meal. We had the best turkey, stuffing and gravy. I enjoyed every bite. I really felt like a family with everybody on this. It sounds kind of corny, but on and off set, we all got along. We were sitting at the table and it just kind of drifted off into the scene. Mark and I were sitting next to each other and we were saying, “I can’t believe this is work!” That’s how Sean set it up and I think it shows in the movie. 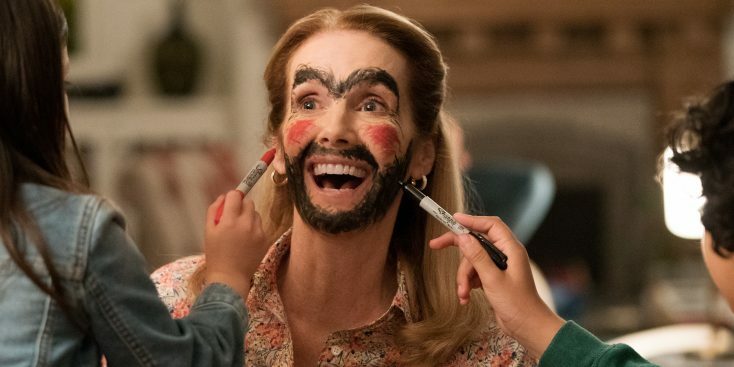 Q: The scene in which the younger granddaughter has drawn a beard, mustache and thick eyebrows on your face with markers was another hilarious moment. Hagerty: That came from a picture that was drawn by Mark Wahlberg’s son. Mark showed the director and me a picture of his son with his face painted like that and the makeup artist used that to do my face. The trick there was for me to forget that my face looked like that which I did do. It’s more a sight gag than anything else. There was a little competition between the two grandmas. She got the t-shirt and I got my face painted. Margo (Martindale, who plays Wahlberg’s mom Sandy) got the t-shirt. Q: How did the role come to you? Hagerty: I didn’t know Sean Anders beforehand but when I saw the script I knew I wanted to be in this. I was so excited. I thought it’s what we need right now. I’ve never seen a film like this. It opens your heart to friends and family, with this whole wonderful exposure to adoption and fostering children. Sean adopted three beautiful children. This is a stretch to make it more cinematic but he’s so passionate about it and it’s such a good thing. Children need good homes. And a lot of adults feel their lives would be changed by adopting these children. Q: You get to work with Rose Byrne and Mark Wahlberg among others in this. Hagerty: It’s a delicious cast. I kept saying to Sean that I’m so proud to be part of his story, that journey. I’m excited for people to see it and enjoy it. It’s a movie that the whole family can go and see a movie together during the holidays. Q: Do you know people who’ve fostered or adopted children. How does fostering touched you in your life? Hagerty: I have a few friends who’ve adopted children. One good friend adopted two children who are now grown. I saw my friend and her husband go through the things that Ellie and Pete go through in the movie, like having the girls come to the house and preparing their house for their (adopted) kids. I’ve watched her girls grow up and one of them has a baby and my friend’s a grandmother. I have another friend who also adopted two kids who are now grown up. Their lives are full and we were able to participate in their lives. It’s pretty wonderful. Hagerty: I have two movies coming out after this. One is called Noelle. It’s a Christmas movie. I’m going to be in a Noah Baumbach film. I don’t know when that’s coming out. It doesn’t have a title yet. I’m also doing a Showtime series now with Don Cheadle. It’s called “Black Monday” and it’s going to air soon. It’s got a nifty cast including Andrew Rannells and Regina Hall and it’s really super fun. So, I’m having a grand old time.